Alert the media. 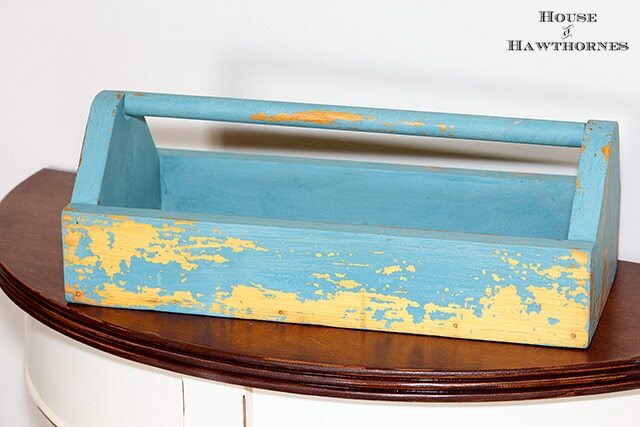 A blogger has used chalk paint! I repeat. 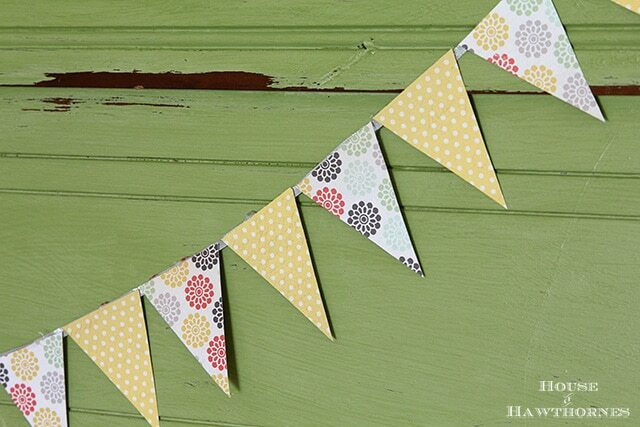 A BLOGGER HAS USED CHALK PAINT! OK, so I may be a little late to the ballgame with this one, but when I see a bunch of bloggers touting the heck out of a product, I normally run the other way. I guess it’s my rebellious side showing. I don’t like to jump on a bandwagon unless it’s going to a Bruce Springsteen concert and even then I might just walk alongside the wagon. But I have been curious about some of the paints I have been seeing out there on the internet. Chalk paint being one of them. 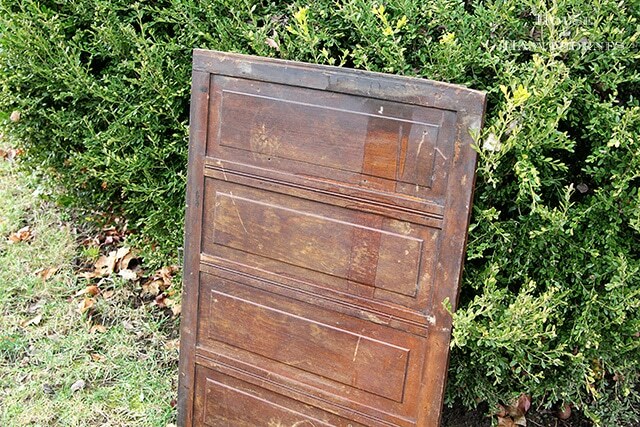 This is a cabinet door that I bought at a barn sale in the fall. 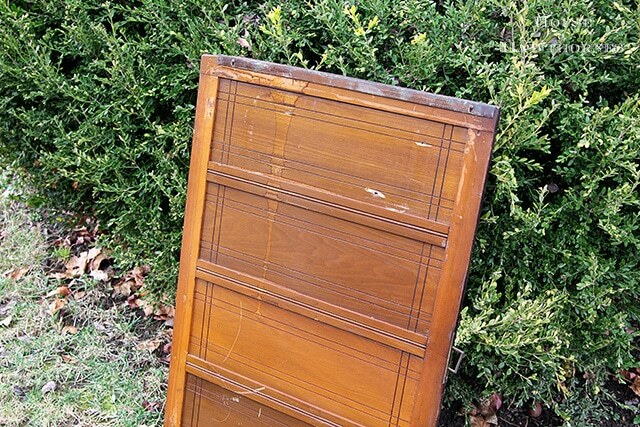 One side is a yummy old paneled wood look, prefect as a photo backdrop or just leaning against a wall (I had a boxwood wreath on it at Christmastime). The other side is a yucky varnished wood look. Although this is the side that was made to be shown, it was just too ugly and shiny for me. 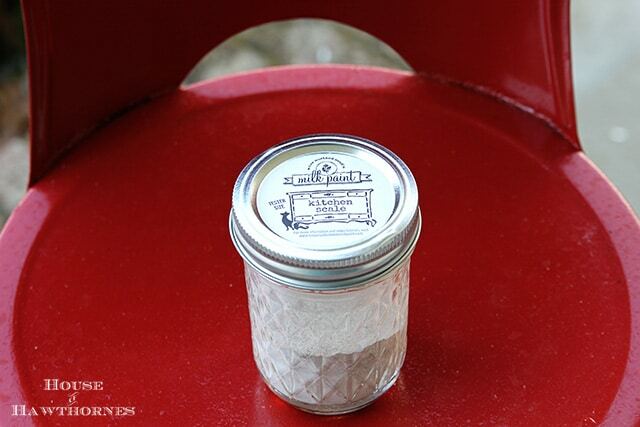 A lot of bloggers have used Annie Sloan Chalk Paint, but the local retailer for that brand is all the way in downtown Columbus, so I trekked a few small towns over to grab a little jar of American Paint Company‘s Clay/Chalk/Mineral Base Paint. The color I chose is Nana’s Cupboard. A delightful green color about halfway between the infamous avocado green from the 70’s and a cottage apple green. I did nothing to the cabinet door prior to painting besides dusting it. Then I slathered on the paint. Two coats. And then distressed it with a wet washcloth. The easiest distressing known to man. No sandpaper needed. Just grab a washcloth, wet it and go to town. I loved how I could pick and choose where and how much to distress it. And now I have the one side painted green and the other side still its original wooden look. Like two doors for the price of one. Since I had so much fun with that paint, I went back to the same store and picked up a little jelly jar of Miss Mustard Seed’s Milk Paint to try it out. For all you milk paint virgins, milk paint comes in a powder and you just add water. 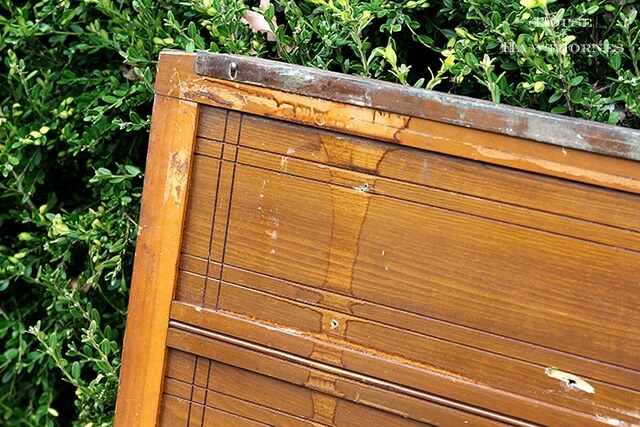 Milk paint has been around for decades. Maybe even centuries. I used it back in the 80’s (please don’t make me feel old and tell me you weren’t even born yet), but back then we used it to paint unfinished wooden pieces. And cave walls. Makes a mean mastodon drawing. But I had never used it on pre-painted wood. In this case, a pre-varnished toolbox that I had bought at a thrift store last year. Just like the chalk like paint, I did nothing to the toolbox before painting it. The color I used was Kitchen Scale. Online examples I could find of it were pretty. In person, I can’t help thinking of that 80’s blue color often found with some country ducks nearby. The lovely and talented Laurie at the blog Vin’yet Etc reminded me on Instagram that it was called Wedgewood Blue. Now, my biggest gripe about this paint, and it’s not really a complaint as much as an observation, is that when it chips (and it’s meant to chip and flake) it isn’t necessarily where you would want it to chip. You have absolutely no control over where it distresses itself. I guess if I were a fly by the seat of my pants sort of girl, then I could be down with that. But I am a little bit of a control freak, so I am thinking that the chalk like paints work better for my anxiety ridden personality. So there you have it. My extremely late to the game personal opinion on the trials and tribulations of internet paints. You really can’t go wrong with either type of paint. It’s just whether you want to control your distressing or not. FYI, none of the paint companies mentioned in this post are sponsors of this blog nor do they know who the heck I am 🙂 Just giving you my opinion in case you want to try out some different types of paint and jump on that bandwagon with me and Bruce. Love that color of green! I cant wait to see all the things you do with this door. Great piece! Glad you tried both the chalk and milk paints. I am not a big fan of the milk paint either since you really have not control over if or where the chippiness will happen. I do like the chalk paint but you really have to wax it well to make sure the surface does not chip anymore. Your door came out really nice. Love the green. I haven’t jumped on the milk/chalk paint wagon yet….. just makes me a bit nervous. But I love what I see and I love how your things turned out. I know the possibilities are endless but I always worry that I’ll hate it and have to start all over again. I have an old arched window that needs some help and I’m planning on going the chalk paint route….. when I get my nerve up! Thanks for sharing! Love your sense of humor, btw! I may be the next blogger to try chalkpaint!!!!! But I am trying white. Everything looks so great! I really love the color green. Great lesson and one I’ve never read nor knew about in the difference between American Paint Company and Miss Mustard Seed’s Milk Paint. Thank you so much! Pam, like you, I’ve tried both Annie Sloan’s chalk paint and MMS’ milk paint, and for me, I preferred ASCP, simply because I find it easier to use (because it’s already pre-mixed) and MMS’ milk paint was just too lumpy and inconsistent for my tastes. At least that’s my opinion . . . for now. Oh, you never fail to crack me up! When I saw the title in my inbox, I assumed that there was further distressing news about menopause! I like chalk paint, but I have compared the homemade kind with the very expensive highly touted brand name. They were pretty comparable in every way, but price. 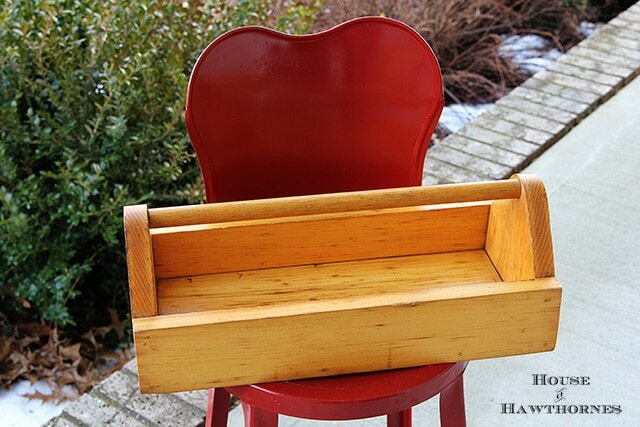 I have tried & love the chalk paint & also have some MMS milk paint I’m going to try. However, I also purchased the bonding agent to mix with the milk paint to eliminate the unpredictable chipping. I sorta dread the mixing as I have heard it is a little tricky getting mixed well. I love the green door! Now, I need Chris to find more doors to paint! As if 16 weren’t enough for our potting shed. Love that green. I seriously love that color. I have never used the milk paint. But when it is on a piece, I would swear that piece has original chippy paint. It distresses to look really chippy like I love old painted things. To me the advantage of chalk paint is being able to paint without prepping a piece with sanding. I do not really like the distressed chalk paint; I like the wax over the painted surface look of it. 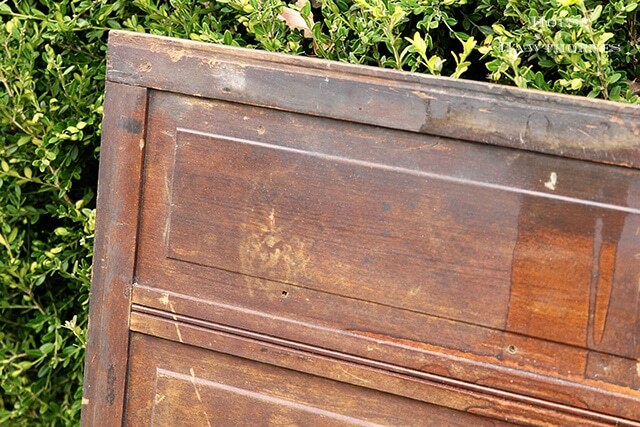 Your tool box does not look “freshly” painted, then purposely distressed – it looks genuinely old (sorry about the blue)! Thanks for the info on these. The paint just transforms the door panel…and I love the color! I have a project I want to try it on, too. I really liked the looks these paints made on the items you chose. PERFECT! You crack me up. Nice paint jobs! I am going to sleep after this because in my so-tired-I’m-not-thinking-straight mode, I was wondering when you were going to show a picture of writing on that chalk paint. And also I didn’t realize it came in green. Wait, that’s chalkBOARD paint. Bedtime for me! You make be laugh–you are late to the game but at least the game isn’t over. I love your opinions being a paint virgin and all.You did an awesome job with the milk paint–I love the colors you chose. I need to do something cool with milk paint. Did it come in the jar? When I got it it was just in an envelope. Enjoyed your post! They carried tiny little clear plastic bags of samples, then this jelly jar size and then larger pouch of her paint. I used about 1/2 of the jelly jar size for that toolbox (2 coats). Have not tried the chalk paint yet. I still haven’t tried chalk or mild paint yet! Guess that’s makes me the person walking behind the wagon. LOL. Great post, I haven’t tried chalk or milk paint yet either but it is on my DO LIST for 2014 and can’t wait. Love how your pieces turned out! I used chalk pain once and liked it. But I mainly am commenting on the Bruce Springsteen idea. I hope you DVR’d him on Jimmy Fallon last night. I heard his new CD and it is good, not great but very good. I saw it on the Today Show this morning and am kicking myself that I didn’t DVR it last night. I bet someone has it on Youtube though. Bruce looks good for a 60-some year old guy! Love that green. It is perfect shade. Pinning it for later reference. Now that is one yummy shade of green chalk paint, Pam! I love the way your door turned out. I had to laugh at your comparison of the blue milk paint to the blue of the 80’s! When I recently painted my armoire blue, I kept having flashbacks to my 1980’s Wedgewood blue kitchen! I believe there were a few geese inhabiting the room. I have a feeling you might live near or in the same town as my brother. I love this, by the way. The color, the texture, everything. I don’t mess with blogger trends until AFTER they are trendy. It makes us stand out, dontcha think? Not one for band-wagons either. 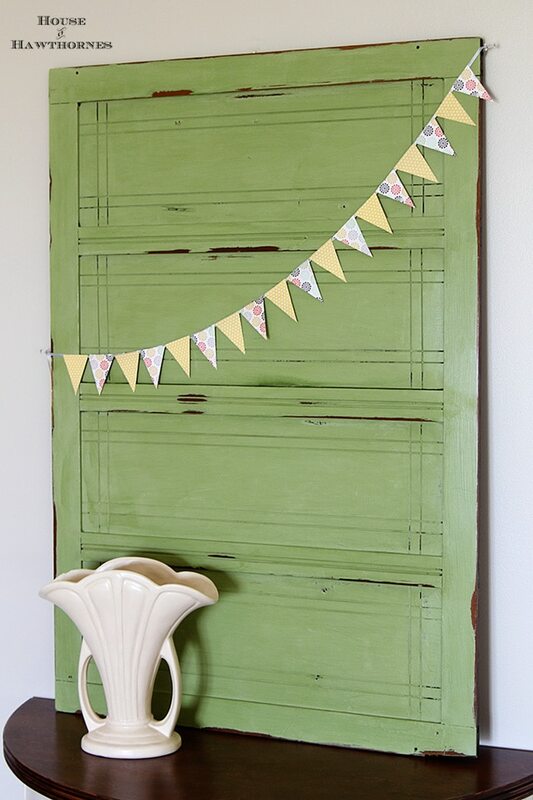 Love the chalk paint, and I’ve had great luck using chalk paint as well. Milk paint.. still haven’t found anything I want to use it on. Thanks for sharing your projects. you can use both sides for different things. i was around in the 80s! Take heart my friend I still sand and paint the old old way. I love the door. I have five pieces of furniture lurking around the house waiting for paint. It is actually cold in the south and I cannot paint. Oh how I love this post!!!! OMG I am so the same when it comes to following the crowd. It’s like those movies that are all the hype…I never see them till “maybe” years later. So funny. Yes, I too hate when I hear someone who looks old was not born yet in the 80’s! I worked with alot of those…who also call shows from back then retro??? Scary…I don’t feel old! I am dying to try this milk paint too. I am so glad to hear it’s that easy to apply. Kinda lazy when it comes to prepping things so this is right up my alley!! I have a few pieces that need repainting since i made such a mess painting them before. I love that colour green!!! Oh and the mention of those blue ducks from the 80″s oh blech! Remember all the wall paper out there with them??!!! Love the finish – it turned out amazing!